24 days before St. Patrick’s day = HOLY %#&@ I FORGOT BREW A STOUT AGAIN! So I wont brew a stout, not because I dont have the ingredients, or because I dont believe that I can push one from grain to glass in 24 days, but because I really freaking want to brew an IPA. Here is the basic idea: Brew an IPA with the same hopbursting process as my last IPA, only change the base malt to Warminster floor-malted marris otter and blend the caramel 30L with some Special B to simulate dark english crystal malt. Change the hops to a blend of bright, critrusy american hops (amarillo and simcoe), with some dark, earthy, tobacco-ish english hops (east kent and fuggle). And yeast….. yes yeast….. mmmmmmm…… how about a nice re-pitch of white labs yorkshire square yeast? Oh good, glad you approve. 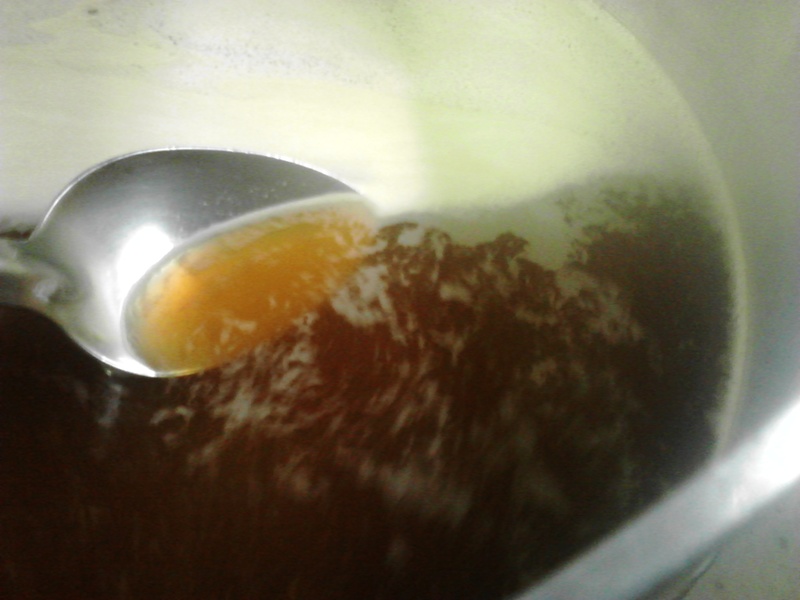 Sorry for the lo-fi picture, in reality this wort was nice bright rusty brown, somewhere between brown and ruby red squirt. After primary is done and the beer starts to visibly clear (basically when I think that enough yeast has dropped out to not leave a giant sludgecake in my keg) I will rack to the keg and add dry hops weighed down with marbles. They will hang out with the beer at room temp for 2 days then the whole lot will be fridged, carbed, enjoyed while fresh. My hope with this brew (other than having something hoppy to quaff whilst celebrating a saint based holiday) is to see how well bright and dark flavored hops work together. With any luck it will taste similar to the newer English hop verieties that have the classic english earthiness, with a touch of bright citrus character. Stay tuned. Oh yeah, I realise that its insensative to drink an English beer on an Irish holiday, but the Irish hooligan in me told me to do it just to rabble rouse.